The name "Anthony Weiner" has been synonymous with scandal and falls from grace since the former congressman first made headlines for sexting with women who weren't his wife, Huma Abedin, in 2011. Well, it seems he's at it again, but with different women. Weiner reportedly sent Twitter messages of his naked torso and barely covered groin to a woman across the country. This new alleged Weiner sexting scandal might end his public office aspirations once and for all. This time, The New York Post published a few pictures and messages, one of which included the purple smiling devil, which accurately sums up his alleged scandalous behavior. Really, how else could you summarize sending a selfie of your crotch — with your manhood clearly visible below white boxer briefs — with your four-year-old son at your side? Weiner's reported conversation was with a woman whom The New York Post described as "a self-avowed supporter of Donald Trump and the National Rifle Association who’s used Twitter to bash both President Obama and Clinton." The publication talked with the woman "on condition of anonymity," and reported that Weiner said the two "have been friends for some time." Weiner hasn't confirmed the sexting, but he has deleted his Twitter account since the news broke. He also said, according to The Post: "She has asked me not to comment except to say that our conversations were private, often included pictures of her nieces and nephews and my son and were always appropriate." I can only imagine that Weiner is suffering from the worst case of deja vu. Just in case you forgot, let's rehash why Weiner resigned from Congress in 2011. He was a representative for New York's Ninth Congressional District when he posted a photo of himself to Twitter wearing tight undies. First, he denied it was him. Then he admitted that it was, and that he had sexting relationships with six or more women. He eventually stepped down in June 2011. 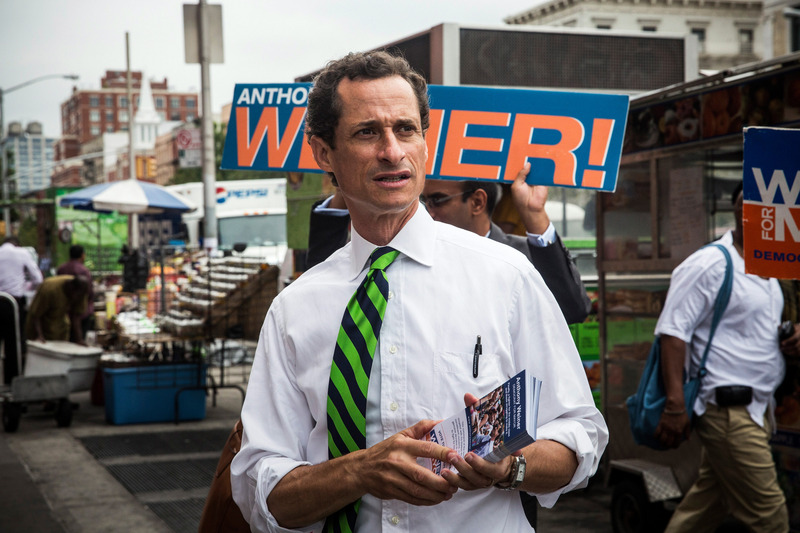 Fast-forward to 2013, and Weiner put his name in the hat to be the Democratic nominee for New York City Mayor. Weiner was polling well. Then came another revelation: He hadn't stopped sexting; he'd only tried to use an alter-ego to do so — "Carlos Danger." He ultimately finished the race in fifth place, while one of the women he had sexted with, Sydney Leathers, urged voters not to support him. Not the comeback he was imagining. According to what the woman featured in the article reportedly told The New York Post, Weiner never met the object of this latest online flirtation, although he did allegedly invite her to New York City to dine at his brother's restaurant. From here, it's unclear where Weiner can go politically. Since the scandal that timed out with his mayoral campaign, he's stayed largely out of the public eye. In March, speaking on a Huffington Post podcast, he confirmed that races were out of the picture — at least for now. "I would be a better elected official than a lot of these people are, but I think I’m practical enough to realize it is not going to happen," he said on the episode. These latest revelations would seem to cement that truth.